Niket Bhatti doesn't usually go to Club Republic in Leicester on a Thursday night but this week he made an exception. There'd been rumours that Drake was going to turn up at the small venue and Niket is a massive fan. Many didn't believe the three-time Grammy award winner would actually show at the 2,000 capacity club. He'd made a similar promise in 2017, and not turned up. He then had to wait over two hours before Drake came on stage at 01:20 GMT. 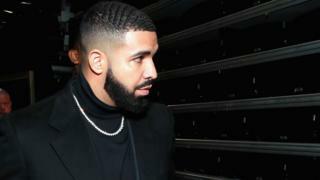 The Canadian rapper had been playing to a crowd of 16,000 earlier in the night in Birmingham as part of his Assassination Vacation tour. "The build-up was insane," Niket explains. "It's like they kept prolonging it. I was having doubts as well. Some people were like he's not going to turn up." Student Diya Rajesh was also sceptical about whether he would actually perform at such a small venue. She says: "Someone on the stage said Drake is in the building and then everyone was really excited and then he came out." "He was just like 'Hi Leicester' and then he performed a couple of songs." Drake played a number of his biggest hits, including God's Plan, and Nonstop. "It was really good," says Diya. "It was way better than I even expected because it was just the fact that we really didn't think he would turn up and he actually did. "And also because it was quite a small venue we were really close to him." For Niket, it was a night that he will never forget: "For a small city like Leicester it was just amazing. No-one was expecting that."